However you define it – and there are multiple opinions on the matter – the push toward population health management gained momentum in 2015, with more and more providers putting their data to work toward targeted care improvement for those patients most in need. Population health was all the buzz at HIMSS15 in Chicago this past spring, and it will surely be among the hottest of topics when HIMSS16 kicks off in Las Vegas this coming February. It was also, not surprisingly, among the most popular story subjects on Healthcare IT News. Here were the 10 most-read stories on the topic of 2015. Entering a new era of population health -- Brian Ahier's story probed the potential for population health gains as patient engagement takes hold and providers get better at harnessing analytics tools to make the most of EHR data. What to look for in population health at HIMSS15 -- In a follow-up, Ahier got specific, looking toward the world's largest health IT conference and exploring some of the tools for capturing, sharing and using data that would be exhibited there. What exactly is 'population health,' anyway? -- For all the buzz on the HIMSS show floor, some providers still wondered whether pop health was little more than vendor-generated hype. In conversations with various industry types, Tom Sullivan showed that the promise was very real – but also that the exact definition of what it all meant depended on who you asked. Innovation Pulse: Population health's 4-letter word -- In his monthly column, Sullivan explored the concept further – and found that, for all the talk about patient portals, health information exchange and accountable care, population health management boils down to one simple word: data. Geisinger making Epic, Cerner work together for population health -- The push toward pop health can make for some interesting pairings, as trailblazing integrated delivery network Geisinger showed this past month, when it announced it would apply Cerner's cloud-based analytics platform to its Epic EHR. "We need to make sure that we are doing things right and the best way we possibly can on both a micro level at the individual and a macro level at the population level," Geisinger's Chief Data Officer Nicholas Marko, MD, told Healthcare IT News. Population health done three ways -- In this contributed blog post, Karen Handmaker, VP of population health strategies at Phytel, offered three case studies that showed how different providers were making big strides in how they manage their patient populations. Population health analytics: combatting challenges -- Still, success does not come without hurdles. In this blog, a healthcare consultant showed how PHM is a "strategic imperative" – but one that most providers are still in the early stages of grappling with, working toward untangling data governance issues and working, haltingly, from descriptive to predictive analytics. 5 hurdles en route to population health -- From lack of compliance from clinicians to lack of engagement from patients, Sullivan spotlighted some of the ongoing challenges to more widespread gains with population health. Big data holds keys to population health -- "Population health management requires much more than EMR to manage clinical and claims data," Sarah Mihalik, VP of provider programs at Explorys, told Healthcare IT News in this preview of her presentation at our Big Data and Healthcare Analytics Forum in Boston this past November. Can population health IT investments pay off? -- As 2015 got under way, we looked into a KPMG poll that showed nearly one-third of providers expecting their investments in population health analytics to pay off – but not for five years or more. 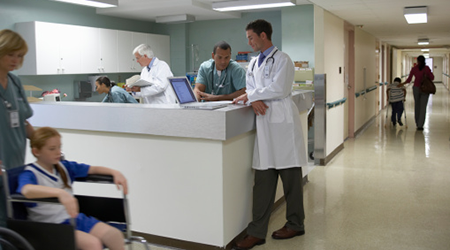 "Healthcare providers are facing a seismic shift in the coming years, largely because government and commercial payers will increasingly decline to pay for avoidable hospital visits," said Joe Kuehn, a partner with KPMG's healthcare advisory practice.